How to develop new business models that anticipate customers’ needs and market’s trends? How to make IT innovation fully sustainable also by using all the data (inside & outside the company)? How to manage technology disruptions? Here a “N.IT.I.D.” tool to address such an issue of nowadays businesses of whatever industry. A list of ideas that might have no sense (apparently!!!) has been written down. It’s time to make order upon the chaos by giving to each idea a title. An image that simplify the idea in one #hashtag. Then, remove all the ideas that are redundant because the have the same image, title or #hashtag. Then, rank all ideas (e.g. : team members votes) and eliminate the ones less relevant. For example, keep only 30 ideas out of 200\500 initially generated. for each second level group, summarize a general topic (avoid a list of ideas) or a common theme. identify relations among groups (correlations, dependencies). Now it’s time to think about a solution: how to develop a solution that meets the needs and opportunities that has been previously brainstormed, simplified and organized? Many solutions should be brainstormed again and evaluated according to a list of “key performances” that are needed for implementing the new functionalities (needs). That’s more likely the most challenging stage since both lateral and vertical thinking are required for generating new solutions and for evaluating them according to the key performances required from customers. A list of selected solutions and possible business models that are possible thanks to IT innovations and technology improvements are now available with an evaluation that is linked with key performances. How to select the only one that is sustainable and worth to develop? That is the final Selection stage where each solution is compared and assessed against accordingly what is already provided by competitors. An example of how N.IT.I.D. 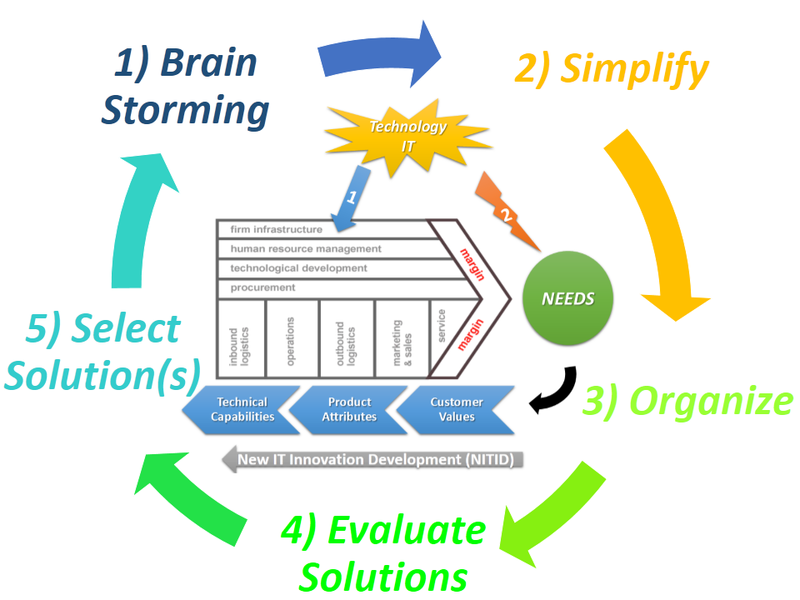 process might be helpful in order to find opportunities and threats (disruptions) from IT and technology innovations? …how to improve a service like the one of TripAdvisor closer to customers’ needs? This entry was posted in BigData, Business World, Science & Technology, Strategy and tagged Business Model, innovation, IT, New Product Design, Strategy by ivangruer. Bookmark the permalink.